After serving as national security adviser to President Carter, he became one of the best foreign policy minds in U.S.
WASHINGTON — Well before he won the presidency in 1977, Jimmy Carter was impressed by the views of foreign policy expert Zbigniew Brzezinski. That Carter immediately liked the Polish-born academic advising his campaign was a plus. “He was inquisitive, innovative and a natural choice as my national security adviser when I became president,” Carter said in a statement following Brzezinski’s death Friday. Earnest and ambitious, Brzezinski helped Carter bridge wide gaps between the rigid Egyptian and Israeli leaders, Anwar Sadat and Menachem Begin, leading to the Camp David accords in September 1978. Three months later, U.S.-China relations were normalized, a priority for Brzezinski. He also had a hand in two other controversial agreements: the SALT II nuclear weapons treaty with the Soviet Union and the Panama Canal treaties ceding U.S. control of the waterway. 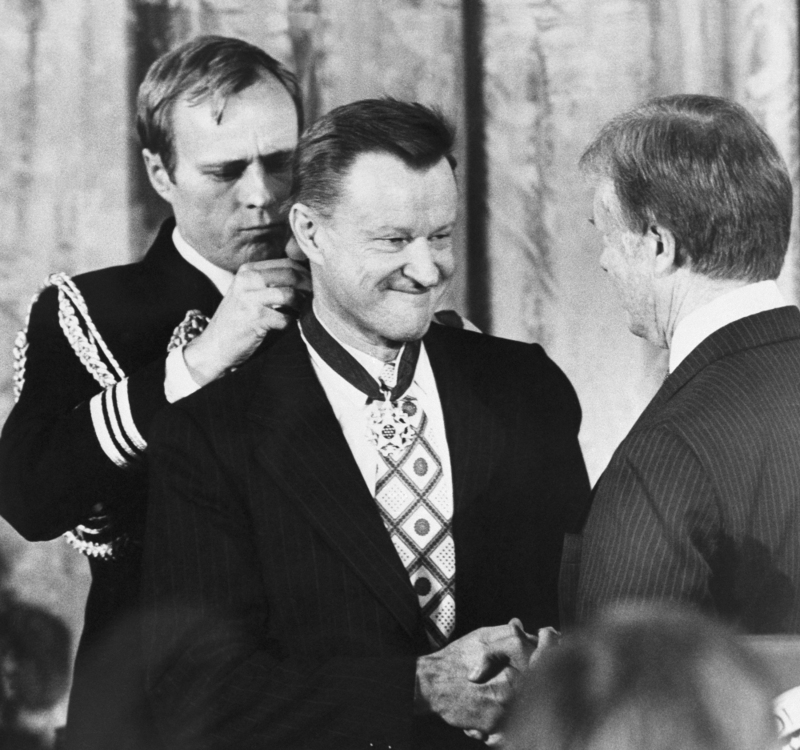 “He was brilliant, dedicated and loyal,” said Carter, who awarded Brzezinski the Presidential Medal of Freedom days before leaving office in 1981. Brzezinski’s death at age 89 was announced on social media Friday night by his daughter, MSNBC host Mika Brzezinski. She called him “the most inspiring, loving and devoted father any girl could ever have.” Also surviving Brzezinski were his wife, Emilie, and their sons Ian and Mark. Born in Warsaw and educated in Canada and the United States, Brzezinski was an acknowledged expert in communism when he attracted the attention of U.S. policymakers. In the 1960s he was an adviser to John F. Kennedy, served in the Johnson administration and advised Hubert Humphrey’s presidential campaign. He was the first director of the Trilateral Commission, an international discussion group, serving from 1973 to 1976. In December 1976, Carter offered Brzezinski the position of national security adviser. Brzezinski had not wanted to be secretary of state because he felt he could be more effective working at Carter’s side in the White House. Brzezinski often found himself in clashes with colleagues such as Secretary of State Cyrus Vance. For the White House, the differences between Vance and Brzezinski became a major headache, confusing the American public about the administration’s policy course and fueling a decline in confidence that Carter could keep his foreign policy team working in tandem. Carter was desperate to end the standoff and, over Vance’s objections, agreed to a long-shot plan to rescue the hostages. The mission was a complete military and political humiliation and precipitated Vance’s resignation. Carter lost his re-election bid against Ronald Reagan that November. Brzezinski’s climb to the top of the foreign policy community began at Canada’s McGill University, where he earned degrees in economics and political science. Later at Harvard, he received a doctorate in government, a fellowship and a publishing contract – for his thesis on Soviet purges as a permanent feature of totalitarianism. Still, Brzezinski characterized himself as a “dawk,” suggesting that he might have had reservations about other aspects of American policy in Southeast Asia. Impressed nonetheless, the Johnson administration appointed him to the State Department’s Policy Planning Council in 1966. Though he was low on the White House totem pole, the position gave Brzezinski entry to the highest circles of White House decision-making.